Louder Than Life, the World’s Largest Rock ‘N’ Roll Whiskey Festival, returns to Louisville, KY even bigger and better in its fifth year, with festival producers delivering the most spectacular music lineup since the festival began in 2014. Louder Than Life will feature the Danny Wimmer Presents debut of quintessential rock band Guns N’ Roses (in their first appearance since performing in Hawaii in December 2018), the return of chart-topping, festival favorites Slipknot and Disturbed, a reunited Staind (in their first public performance in 5 years), Godsmack, Rob Zombie, A Day To Remember, Ice Cube, Marilyn Manson, Breaking Benjamin, Chevelle, Halestorm, and many more. Louder Than Life exclusive VIP packages, General Admission tickets, camping and hotel packages go on sale today, Monday, April 8 at9:00 AM ET. 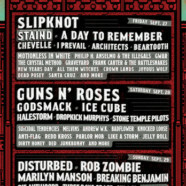 Visit www.LouderThanLifeFestival.com for details. Fans interested in attending all three DWP weekends at KY Expo Center, also including Hometown Rising Country Music & Bourbon Festival (September 14-15) and Bourbon & Beyond (September 20-22), can purchase a special Trifesta Pass, which allows General Admission weekend access for the discounted rate of only $229.00 plus fees. Visit https://trifestapass.com for more information. Danny Wimmer Presents is proud to announce a collaboration with Metallica’s Blackened Whiskey and Enter Night Pilsner. Blackened, a super-premium American whiskey blend crafted by the late Master Distiller Dave Pickerell and finished in the earth shattering music ofMetallica, and Enter Night Pilsner, a collaboration with the rockstars of craft brewing Stone Brewing Company, will come together under one roof to offer guests a one-of-kind musical festival experience. The festival’s centerpiece, Kroger’s Big Bourbon Bar presented by Louisville Courier Journal, will feature more than two dozen hand-selected bourbons from top distilleries, and a unique opportunity to enjoy bourbons and exclusive one-time specialty cocktails from 1792,Angel’s Envy, Barrell Bourbon, Coopers’ Craft, Elijah Craig, Four Roses, Jeptha Creed Four Grain Bourbon, Kentucky Peerless,Michter’s, Old Forester, Rebel Yell, StoneHammer, Wild Turkey and more to be announced. Fred Minnick’s Mini Bar–hosted by the Louder Than Life bourbon curator, bourbon author/expert, and Amazon Prime host (Bourbon Up)–will showcase craft selections from Louisville’s world-renowned distilleries. Acclaimed Louisville whiskey bar The Silver Dollar will operate The Hunter’s Club, where attendees can find vintage bourbons dating as far back as the 1930s, as well as contemporary collectibles. The initial list of participating bourbon brands at Louder Than Life includes 1792, Angel’s Envy, Barrell Bourbon, Coopers’ Craft, Elijah Craig, Evan Williams, Four Roses, Jeptha Creed Four Grain Bourbon, Jim Beam, Kentucky Peerless, Larceny, Maker’s Mark, Michter’s, Old Forester, Rebel Yell, StoneHammer, Wild Turkey, Willett, and Woodford Reserve. Whiskey sponsors also include Jack Daniel’s, Southern Comfort and Uncle Nearest. In addition, attendees can enjoy a variety of local and regional food and beverage offerings provided by DWP’s affiliate concessionaire,Southern Hospitality Concessions LLC. Festival attendees will be able to experience a taste of Louisville with selections from the followingrestaurants: Boss Hog BBQ, Couvillion, Doc Crow’s Southern Smokehouse & Raw Bar, Ehrler’s Ice Cream, Eli’s BBQ, Heine Brothers Coffee, Hull And Highwater, Joella’s Hot Chicken, Martin’s BBQ, Merle’s Whiskey Kitchen, River Road BBQ, Sarino, Seviche, and more. Look for more food experience details to be announced soon. Camping spaces for cars, tents, and RVs start at just $145.00 and include 4 nights’ stay in the Louder Than Life campgrounds. Camping passes also allow patrons re-entry privileges to and from the festival site all weekend long. Mint Experience VIP tickets include access to VIP Hang—an exclusive hang area with dedicated bars, comfortable furniture, and live audio/video streams of the Monster Energy Barrel Stage and Oak Stage, plus front-of-stage viewing of the Oak Stage—as well as a dedicated merchandise stand, premium dedicated food offerings, air-conditioned and flushable restrooms, dedicated entrance lanes into the festival and a commemorative laminate and wristband. Top Shelf VIP tickets include access to all Mint Experience VIP amenities, plus access to the Top Shelf Hang and other amenities including: air-conditioned lounge/tent with live audio/video streams of Monster Energy Barrel Stage and Oak Stage, front-of-stage viewing area for Monster Energy Barrel Stage, shaded viewing deck, all-inclusive premium drinks at dedicated bars within the hang area, complimentary hors d’oeuvres during lunch and dinner hours, dedicated air-conditioned and flushable bathrooms, massage station, complimentary lockers with cell-phone chargers, complimentary Wi-Fi access, Top Shelf VIP Concierge staff and a commemorative Top Shelf VIP laminate and RFID wristband. Louder Than Life sponsors include Kentucky Tourism, Louisville Tourism, Monster Energy, Jack Daniel’s, Kroger, Tito’s Handmade Vodka, Southern Comfort, Uncle Nearest Whiskey, f.y.e., The Music Experience, Fxck Cancer, Take Me Home, Against The Grain, and Zyn. The Highland Festival Grounds At KY Expo Center are located at 937 Phillips Lane in Louisville, Kentucky. Festival doors open at 11:00 AM daily.